Please be sure to arrive early and get in line as tours are on a first-come, first-serve basis and leave promptly at their scheduled time. If you or someone in your party has special needs, please let your ticket agent know so we may be able to best assist you. The start/finish line and pit road experiences are dependent on track activity and will not occur if there are events scheduled. Please visit the track calendar to ensure you have the best experience. This tour is conducted on an open-air tram and Will continue to run in the rain. There is a chance you could get wet. Please check our weather radar for the most up to date weather info. Tours will NOT continue if there is lightning within five miles of the track. Rain checks may be issued, but no refunds will be offered. The Motorsports Hall of Fame of America has moved from its previous longtime home in Novi, Michigan and is now housed in the DIS Ticket and Tours Building, showcasing spectacular displays honoring all forms of motorsports: Stock Cars, Sports Cars, Open-Wheel, Motorcycles, Drag Racing, Land Speed Records, Powerboating and Aviation. 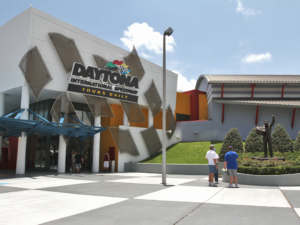 You can now explore the new Motorsports Hall of Fame of America as part of a tour at Daytona International Speedway! Climb aboard an open-air tram and discover what makes DAYTONA the “World Center of Racing as a flurry of action, color and grandeur explodes before your eyes and you’ll know that you’re on the hallowed ground of NASCAR’S marquee race track. A tour experience to remember for any race fan! 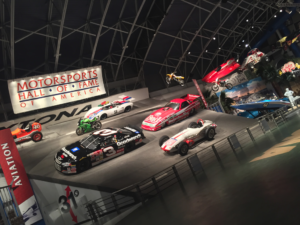 You can now explore the Motorsports Hall of Fame of America showcasing spectacular displays honoring all forms of motorsports as part of a tour! Daily tour tickets are sold beginning at 9am at the DIS Ticket Office. LIMITED AVAILABILITY! Each tour capacity is limited and seating is on a first-come, first-served basis. Runs daily at 11am, 1pm, 2pm; 3:30pm. Experience the 31-degree high banks for yourself as the tram coasts along turns 3 and 4 before finding yourself walking in the footsteps of legends past and present as you climb atop the podium in Gatorade Victory Lane for a photo. End this thirty-minute Speedway Tour by standing next to the car of this year’s DAYTONA 500 champion, left in the same condition as the day it captured the checkered flag. Following your tour, fans can now access the new Motorsports Hall of Fame of America. Adults $18, Kids 6-12 $12; FREE Kids 5 & under. Runs daily on the half hour from 9:30am to 2:30pm. Guests experience a unique opportunity to explore the 2.5-mile Speedway from a variety of vantage points. Take the rare opportunity to come face-to-face with the track as you visit the well-known start/finish line and 31-degree high banks or ride down pit road to get a close-up view of the pit stalls. This tour provides you with unprecedented access: a visit to the media deadline room, a photo in Gatorade Victory Lane and a look inside the world’s first motorsports stadium as you hop onto one of the 40 escalators and are transported into the new frontstretch stadium for a stunning view of the trioval and infield. End the day by standing next to the car of this year’s DAYTONA 500 champion, left in the same condition as the day it conquered the World Center of Racing. Following your tour, fans can now access the new Motorsports Hall of Fame of America. $25 Adults, $19 Kids ages 6-12; FREE Kids 5 & under. Call 1-866-500-8499 for group info. *Tour route subject to change based on track and weather activity. VIP TOURS run on select Tue, Thu, Sat from 1-4pm. If you’re looking for an unmatched look into the past, present, and future of Daytona International Speedway then this is the tour for you. A smaller, more intimate tour provides guests with more specialized attention, while traveling in the comfort of our air-conditioned VIP bus. Visit ISC’s Archives and Research Center where many of racing’s most treasured artifacts, including Sir Malcolm Campbell’s Bluebird III, are stored before heading to the world’s only motorsports stadium. Once inside the massive structure, you’ll get an up-close view of the most famous track in racing as you walk the same grounds that have produced motorsports legends for over a half-century. By the end of this tour you’ll be a motorsports expert as you dive fully into the world of a race team with access to the media deadline room and pit road. Have your photo taken in Gatorade Victory Lane, then travel to get a look inside the world’s only motorsports stadium, as you hop onto one of the 17 elevators and 40 escalators and are transported up into the new frontstretch stadium for a stunning view of the trioval and infield, capped off by a visit in the tower above to the Houston Lawing Press Box overlooking it all. The tour concludes with access to the Coca-Cola Theatre and a close-up look at the Champion DAYTONA 500 Car. $52 per Person. Advance reservations are encouraged. 386-681-5588.